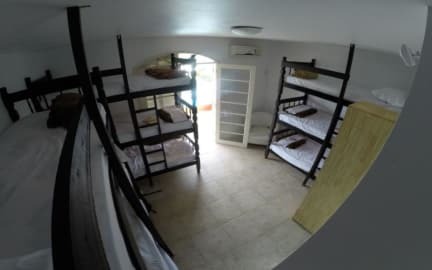 On The Road Hostel, Florianopolis, Brazylia : Rezerwuj teraz! The Hostel On The Road intends to offer confort to sleep, clean and tidy bathrooms and many spaces to socialize: you can exchange literary experiences in the library, eat or play a game in the barbecue area, freshen up in the swimming pool, relax and take your time in the yard or play snooker in the bar and enjoy some of our 300+ LP collection. These many different spaces offer exchange of ideas and experiences as well as a relaxing time. The property is located at 50m of Campeche's beach - one of the trendiest beaches of Florianópolis. Campeche is famous by its incredible surfing waves and concentration of people in the summer. It has easy access to Lagoa da Conceição which is known for it's nightlive and tourism and to the south of the island - a place full of hiking tracks in the nature and gastronomic references.